Why aren't Humboldt's rural roads getting fixed? A slip on Wilder Ridge Road. A Mattole Valley resident for several decades, Teresa Davey is no stranger to rough roads. The 4-mile drive to the local elementary school, which she makes twice daily with her young daughter, requires navigating steep gravel switchbacks and a stretch of river-adjacent road which often floods in the winter. That's on a good year. Over the past two years, a section of her commute has been sliding inexorably into Honeydew Creek, the cracked asphalt crumbling away to leave one narrow lane and a deadly drop. Strong winter rains have sent water cascading down the hill through the slip, eating away even more of the road. When it inevitably slides out, residents on Wilder Ridge will have to drive a torturous 81-mile route south to Redway, north along U.S. Highway 101 to Bull Creek, then back west just to get to the nearest post office in Honeydew. Davey has already begun making plans for her daughter's school attendance, possibly parking a car on either side and then walking across the crevasse. 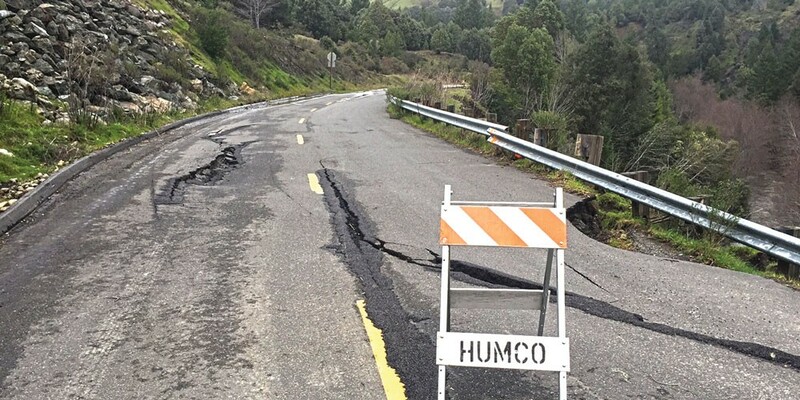 That decision will have to be made soon, as repairs to this and other rural roads in Humboldt County have been hopelessly delayed by a dearth of local, state and federal funds. "I put my life in danger every day," said Davey. "Every day I take Ali to school, I pray I'll make it there and back home." Davey and others in the area have repeatedly brought their concerns to Humboldt County First District Supervisor Rex Bohn, not just about the slip out, but also the 15 miles between Honeydew and Petrolia, the seven-mile stretch of scenic Lost Coast oceanfront and the narrow road through the redwoods at Humboldt Redwoods State Park, all of which are pitted with teeth-rattling potholes. 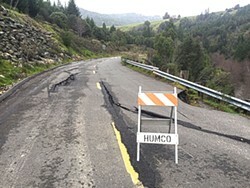 Virtually every route in and out of this remote part of Humboldt is overdue for repair, jangling both the suspensions and nerves of residents. Bohn has become so accustomed to requests that the county do something that he mentioned the roads in his recent eulogy for a Mattole resident, claiming that the deceased's family was concerned that the hearse doors would fly open on the trip to the mortuary. "I'd love to see more stuff get done," Bohn said in a phone interview. "The problem is we have 1,200 miles of road we have to maintain." Bohn was recently detoured on his trip from Ferndale to the Mattole Grange for a pancake breakfast when he had to stop and do traffic control around a landslide in the rain. The landslide made the road impassable for several days. That section of the road — known as the Wildcat — was one of several cited by Journal readers as a perennial problem area. Readers also mentioned Alderpoint Road and Stagecoach Road, both of which failed and had to be closed that same stormy weekend. The slip on Mattole Road, according to Bohn, will have to wait for federal emergency funding before it's fixed. Federal storm damage funding, in which money is released for infrastructure repair after a disaster declaration, is not in endless supply, and county officials have not confirmed a set date for when it might come through for this stretch of road. More cynical locals have expressed the opinion that it might not happen until the road collapses entirely. Humboldt County Public Works Director Thomas Mattson was candid about the uncertain future of our rural roads. "We currently have between $200 and $250 million dollars worth of deferred maintenance," he said. "I do not have anywhere close to enough money to bring our roads up to an acceptable state of repair." Keeping up with the basic maintenance of roads — cutting back brush, cleaning out culverts and repairing potholes — requires $20 million a year, according to Mattson. He currently works with a budget of $10 million, meaning the county accumulates about $10 million in deferred road maintenance annually. To make matters worse, Mattson said he is anticipating his department will see a $500,000 funding reduction next year due to a drop in gas tax revenues. The majority of roads that Journal readers complained about — Dow's Prairie Road, Port Kenyon, and Trinidad's Old Road — are only scheduled for routine maintenance. A few problem spots, including Blue Slide Road (between Rio Dell and Ferndale) and Stagecoach Road, are due for repair once federal funding comes through, but Mattson said he has "no timeline" for these. "All we can do is repair and triage," Mattson said when asked about how his department decides which roads to prioritize. "If it's a major safety issue or a major route, that will take priority. Rural routes that connect communities are important." Mattson's department is eyeing Measure Z funding for repairs on parts of the Wildcat, and Mattole residents have petitioned the county to allocate more of the local tax's revenue toward repairing their roads. With an estimated $754 million dropping out of the state's road infrastructure budget due to falling gas prices, local governments may have to increasingly rely on tax measures, like Measure Z, to ensure basic public safety for rural residents. Meanwhile, at least some of the more egregious potholes in this corner of the county will probably get patched, thanks to the impetus of the annual Tour of the Unknown Coast, a 100-mile bike race that has taken place on the first weekend of May for the past 38 years. Potholes on blind corners in particular pose a danger to cyclists, and every year race staff drive the course from Ferndale through Rio Dell, out the redwoods through Honeydew, through the Mattole Valley to Petrolia, then over the Wildcat back into town. This year, director Vic Armijo anticipates a rougher-than-normal route due to the rainy winter weather. "Members will let the county know about areas of concern," he said. "Usually they get out there quite a ways ahead so the patching has time to settle." Those patch jobs are a stipulation of granting a permit to Tour of the Unknown Coast. The county must address any liability issues prior to the race. When asked about this year's repairs, Mattson replied in an email intoned with his characteristic caution. "We try every year to hit the Mattole Road maintenance needs at that time and will do what we can again this year, however it is in really bad shape this year." Is It Gonna Get Fixed? Source: Roads were identified by Journal readers, and maintenance updates were provided by Humboldt County Public Works Director Thomas Mattson. Correction: The original version of this piece included a reference to Old Road Trinidad. No such road exists; the reader was referring to the "old road" that runs parallel to the beach. Information about that road will be included in a follow up article. The Journal regrets the error.